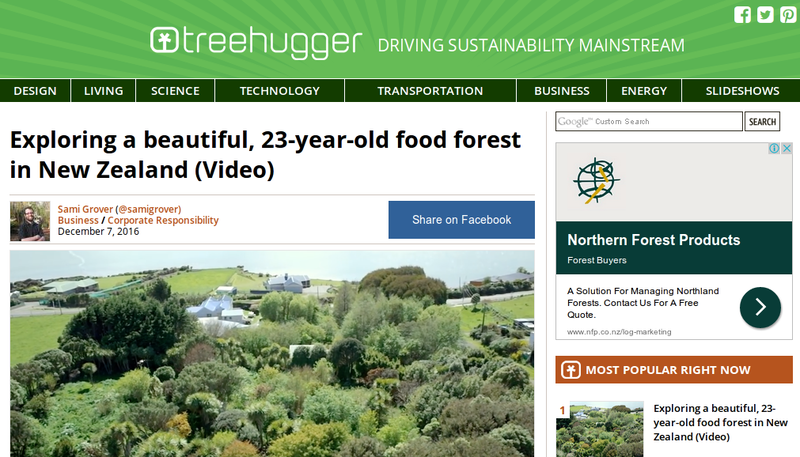 Our film is being featured at www.treehugger.com, something I'm especially excited about - Treehugger is an internationally recognised site for all manner of great ideas and I'm proud that we are one of those :-) Here's the commentary they wrote to introduce, "An Invitation for Wildness". "I've asked this before—but having toured many permaculture gardens and food forests in my time, I've often had one big question: Can you really establish a satisfying, nutritious diet from the hodge-podge mixture of herbs, fruits, nuts and perennial vegetables that seem to make up the mainstay of such plantings? So this latest offering from the ever fabulous Happen Films is particularly welcome. Exploring the beautiful-looking, 23-year-old, 2-acre food forest created by Robert and Robyn Guyton on the South Island of New Zealand, the video is worth watching just for the sheer beauty of what a mature food forest can look like. But I'm also struck by Robert and Robyn's insights on how to approach forest gardening—namely by letting go, letting the system evolve of its own accord, and applying a light touch in terms of management and "editing". Robert also touches on the very topic that has always had me skeptical: to eat primarily from a forest garden, you have to learn to adapt to what nature offers you. You're not going to find six heads of perfect lettuce on any one day—but you might rustle up a unique salad of wild and unusual vegetables. According to Robyn, the couple get about 70% of their food from the land. Which is pretty damn good. I confess I still have a hard time imagining myself living primarily off the bounty of a food forest. I've eaten a fair few comfrey fritters in my time, and they're good, but Lord do I love tater tots. Still, I'm glad there are folks out there who are more adventurous than I. And I'm pretty sure the birds, bees and microorganisms that have made the Guyton's garden their home are pretty glad too."